Alaska State Troopers is an American documentary television series. 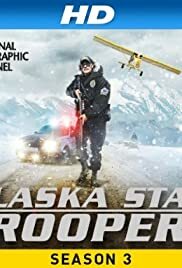 The show primarily follows the daily beats of various bureaus within the Alaska State Troopers. In addition, the show features segments that follow village public safety officers from small rural villages as well as officers from other cities such as the Wasilla, Palmer, Anchorage, and Soldotna. The show follows the exploits of a number of officers from all regions of the state. Troopers who are seen on the show include: James and Anne Sears, Howie Peterson, Jon Simeon and Brent Johnson, Scott Quist, Odean Hall, Lonny Piscoya, Luis Nieves, Dan Dahl, Rick Roberts, Abraham Garcia, Dan Cox, Gabe Rich, Jonathan Stroebele, Joshua Varys, Daron Cooper, Lance Ewers, and Kamau Leigh. In 2011, a litter of Blue Heeler puppies were dropped off anonymously at a dog shelter in Kentucky. The two males were named “Trooper Dan Dahl” and “Trooper Howie Peterson”, after the Troopers on the show. The female dogs were named after Troopers Aileen Witrosky, Amy Bowen and Anne Sears, who have all been featured on the show.